If you provide appliances in your rental unit then appliance repair will be your responsibility. Damage to the appliances are sure to become an issue given the abuse that these go through at the hands of tenants. You can ensure minimal damage is caused to the appliances installed on your property by providing thorough guidelines on how to use appliances properly. Generally, electric appliances last for at least 10 years and even longer if used carefully. However, no matter how carefully your tenants use them, appliances are bound to have issues every now and then. It is worth noting that appliance repairing is quite expensive in this country as technicians charge about $150 per service call and the amount has to be paid before they touch the appliance to fix the issue. We have a better advice for you, which is to adopt a DIY approach while tackling with appliance repairs. This would help in reducing your overhead. Are you feeling nervous about having to do appliance repairs yourself? No need to feel wary at all as it is quite easy to repair appliances. All you need to do is research about techniques of repairing different items at YouTube and prepare is handy appliance repair toolbox. 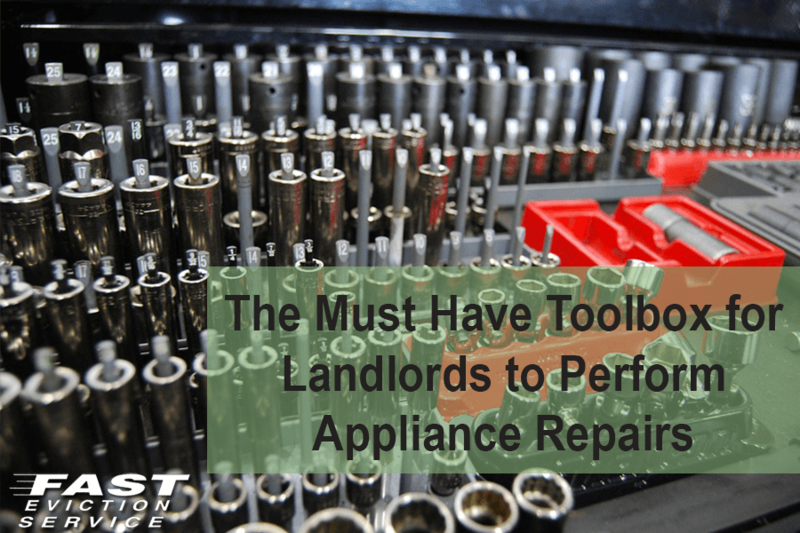 What do you need in an appliance repair toolbox? Moreover, you will need a laptop with fast internet connection. That’s because the internet is a helpful source for learning about the product’s specifications, instructions on repairs and salient tips. It is even more helpful when you don’t have the manufacturer’s manual at hand and need to fix the appliance on urgent basis. Furthermore, it is the best platform for finding and ordering replacement parts. Googling an issue is probably the easiest way to find possible fixes for the appliance. Simply open the browser, type the model and make of the appliance and specify the problem. Be very straightforward and to-the-point while typing in the problem and omit unnecessary terms like How To, etc., and you will instantly find a YouTube video or a How-To article explaining the solution. In case you do not find desired results, then search for the service manual by including the term Manual with the model and make of the appliance and click on search button. Once you are ready to perform the repair do make space for yourself so that you get plenty of room to work. Clean the area around the appliance and then disconnect and move it as far away from the wall as possible. Always keep rags and buckets (as per the nature of the issue) to catch water that is spilled from washers or other plumbing related problems that might involve water spilling. You may also need to let the appliance plugged in in some situations so to addresses this sort of a problem you need to have an extension cord in your toolbox. Prior to disassembling something you need to take pictures as it will help you remember how every component/part was assembled together originally. Delete the picture after the problem is fixed. Many times amateur technicians forget where they put the screws and without appropriate screws, an appliance cannot be put together. Therefore, you must keep a small, clean container in your toolbox so that none of the product’s screws get lost during the repair process. You might want to perform every single repair yourself but there are certain issues that are difficult to handle on your own so sometimes you must consult an expert technician or change the appliance. For instance, if the refrigerator’s compressor is faulty then it is no use to get the compressor serviced because a new refrigerator would be cheaper to buy. Similarly, if the refrigerator has gas leakage issue then hire a licensed technician to service it; if the water or space heater’s gas valve is giving problems then an expert would know how to handle the problem well. However, there are certain problems that you can fix yourself such servicing the thermocouple, adjusting and cleaning the pilot tube or gas, space or water heater burner. You can also change the thermostats and elements installed on an electric water heater. You can successfully replace and/or repair the door seals, water supply hoses, refrigerator control board and deice or clean the coils. Moreover, you can easily service the electric heating element and belts on the dryer and clean the vents as well as change the drain pump, belts and control panel of the washing machine. Maintenance of appliances can produce remarkable impact on their overall functioning and performance, which is why we stress upon preventive maintenance. If you perform maintenance regularly then the need for major repairs won’t arise at all. So, make sure that you perform the following tasks once a year or ask your tenants to do these tasks for ensuring optimal performance of the installed appliances. Lastly, keep a maintenance record for every appliance installed at the unit to make instant diagnosis of the issue later on.